I was greeted with sunshine and happy, enthusiastic children on my recent visit to Holy Spirit Primary School in Ringwood North. This school community raised $2,400 for CatholicCare, and I was there to thank them for their initiative and discover just how they did it! The funds were raised through a Small Business Expo held at the school last term. 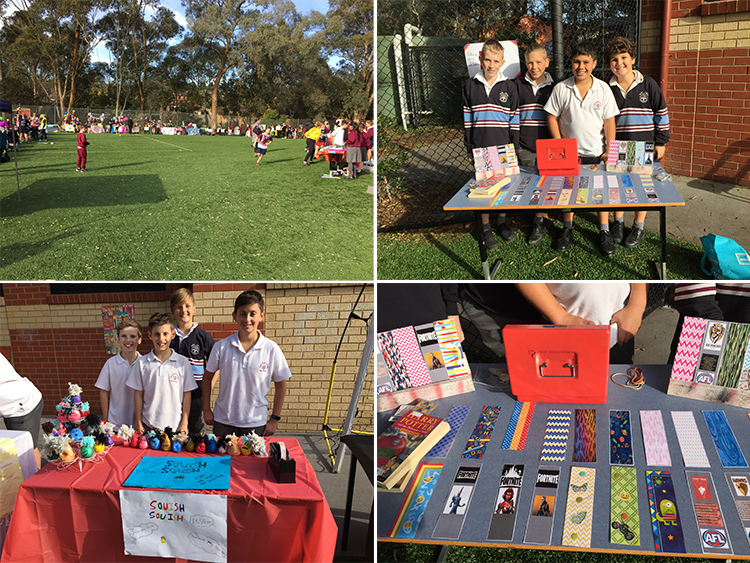 Year Fives and Sixes were challenged to work together in groups to develop a small business in which they would sell hand crafted items. The students worked to create a marketable and unique product or service, some of which included handmade bracelets, bows and hair decorations, knitted scarves, ‘slime’, bookmarks, greeting cards, and hand massages. They also created websites and flyers to promote their businesses (with a minimal amount of paper and/or cardboard allocated to each group) and slideshows were developed to highlight the goods they were going to sell. The students were given the option of five Catholic charities in which all of the money raised would be donated to, and we are incredibly grateful that they chose to support the work and mission of CatholicCare. This fundraising activity was part of a religious education unit, focused on taking action in relation to social welfare/justice that would help others in our community. I would again like to thank the students for their hard work and care in putting their businesses together and making their uniquely crafted items. The Holy Spirit Primary School was given a Certificate of Appreciation which was presented to the principal, Mr Duncan Arendse, along with some seeds to grow in their school vegetable garden. Written by Jeff Wild, Community Engagement Coordinator at CatholicCare. Easter: What can it mean? Your gift this Easter will impact more than just one person. It will help to create the cornerstones of our community. Sign up for our free newsletter and receive the latest news and upcoming events.